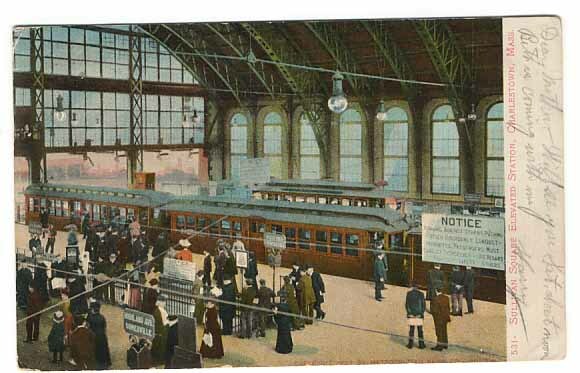 The original Sullivan Square Station in Charlestown in about 1900. Image courtesy Boston Public Library. Sullivan Square in 1929. Image courtesy Boston Public Library. 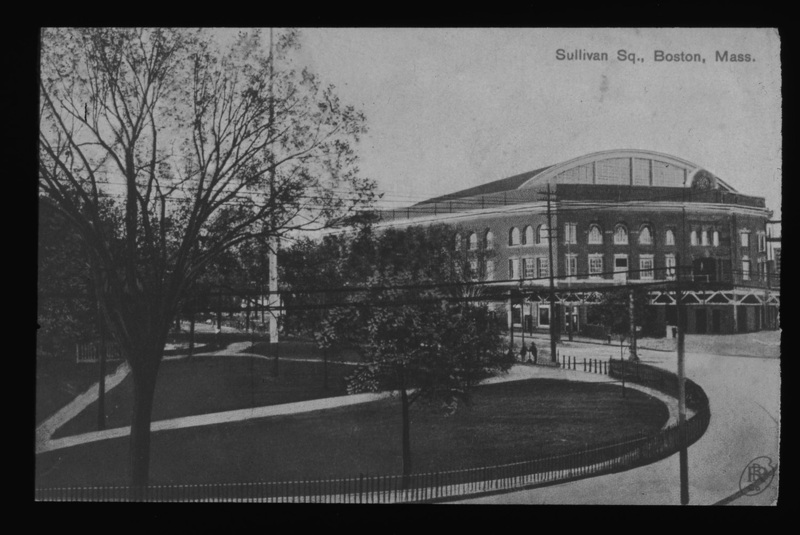 The photograph above shows Sullivan Square in 1929. The Google Map below shows Sullivan Square today. 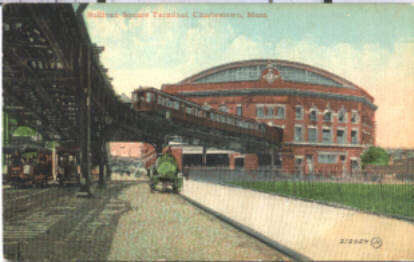 In the 1929 photograph, the tracks of the Charlestown Elevated, predecessor to the modern Orange Line, and the Elevated's grand station in the square dominate the view. There are some small shops and homes and two parks, yet the composition of the square is largely industrial with factory buildings and BERy shops. Streetcar tracks are visibly planted in the streets. Today, most of smaller shops appear to be gone, replaced by factory buildings and the relocated Sullivan Square station. 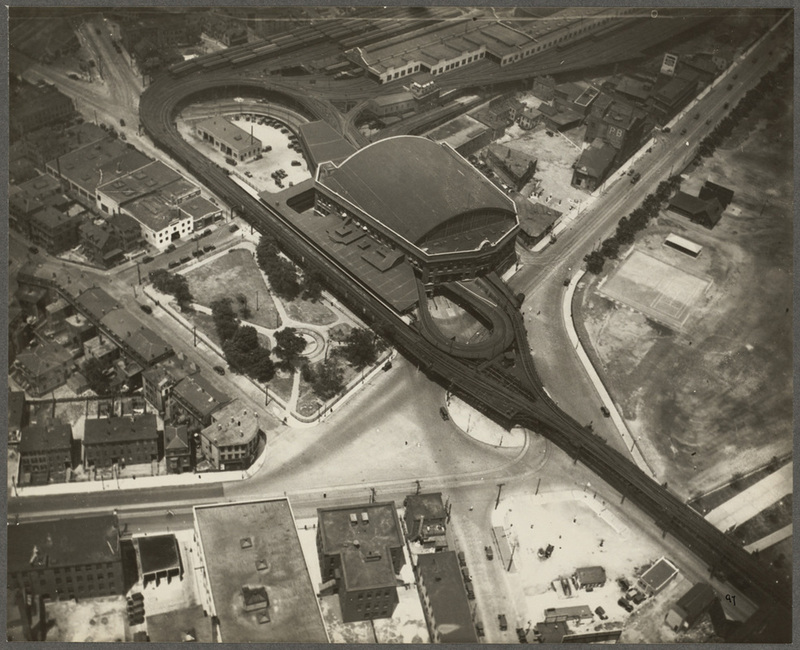 Most notable is that Rutherford Avenue and Alford Street have both been widened significantly to greater resemble a highway, and that the park in the 1929 photograph by the old Sullivan Square station is now a parking lot for the new station. The old station's lot has been recycled into an MBTA maintenance facility. As you can see, the main streets were much less wide and the intersection at Sullivan Square proper, since reconfigured into a rotary, capable of handling less traffic. 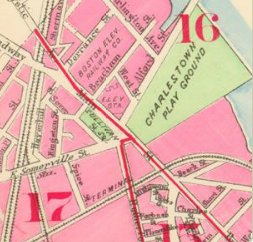 The old Sullivan Square station, as indicated by the map above, was located at what was then, as is now, the lot between Alford, West, Beachman and Main streets. The old station was considered a crown jewel of the BERy system. It boasted magnificent architecture, with sweeping ceilings, a spacious hall and a grandiose, imposing profile overlooking the square. The station was also practical, providing a direct cross-platform transfer between El trains and the multiple streetcar lines that served the station. The station's grand interior. Note the cross-platform transfer between El trains and streetcars. The station's prominence stood for its crucial role in the BERy network. In addition to El trains, multiple streetcar lines terminated at the station. Most notably, the station served as the southern terminus of the Fellsway line, which ran from the station to the town of Stoneham. Many a Bostonian rode the Fellsway line to visit Stoneham's recreational attractions, most notably Spot Pond and the Stone Zoo. 1936 BERy map showing seven streetcar lines and three bus lines terminating at Sullivan Square. By the 1970s, the Sullivan Square station, along with the rest of the elevated Orange Line, had deteriorated significantly. The station itself was dirty and in need of repairs, and Bostonians had generally begun to grow tired of elevated railways blocking sunlight from the streets.. 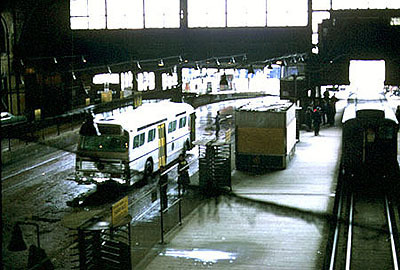 The gritty Sullivan Square station of the early 1970s. Note that buses have replaced streetcars and use the station's cross-platform transfer feature. The parking lot and bus loop of the new station, pictured above, are located roughly in the area between Haverhill Street and Kingston Street, if you look at the 1929 map earlier on the page. 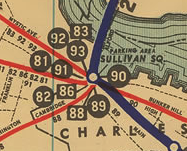 Today, Interstate 93 runs above the railroad right-of-way shown on the 1929 map, with the Sullivan Square Orange Line station underneath the highway serving the relocated Orange Line, which runs along the old right-of-way. The railroad right-of-way was owned operated by the now-defunct Boston and Maine Railroad. Near Sullivan Square, as shown on the 1929 map (re-shown below), the railroad split with one branch continuing north and another diverging west. The western spur was an industrial spur leading to Mystic Pier. Now used to receive shipments of new cars, Mystic Pier was once a substantial freight hub, with the industrial spur providing the industries on the pier with a rail connection to western clients. Aerial view of Mystic Pier. Remnants of the spur are especially plentiful. Tracks are visible all along the spur's old right-of-way, particularly in Sullivan Square itself. Where trains on the spur crossed Rutherford Avenue in Sullivan Square, the tracks are still partially embedded in the Avenue's pavement. Note that the tracks are still intact within their former right-of-way. There are even remnants in the square of the streetcar lines that served the old station. Coming out of the MBTA service lot into which the old station's land plot was repurposed, there are streetcar tracks extending onto Alford Street and, within the confines of the parking lot, still embedded in original cobblestone! 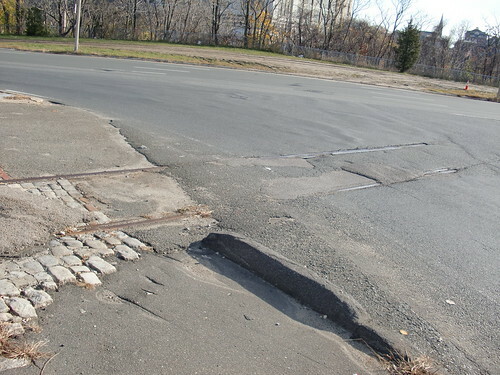 Genuine streetcar tracks leading out of the MBTA service lot/site of old Sullivan Square Station. Among the greenery at the center of the square's rotary, a concrete elevated support remains. The Schrafft's building once housed the main factory of Schrafft's candy and chocolate company, a prominent Bostonian business. Since redeveloped into an office complex, the building stands tall over Sullivan Square to this day, serving as a testament to the square's rich history and, together with the aforementioned railroad remnants, cementing the square's position as a significant center of Bostonian history for years to come.